It takes 30 days to change a habit. Your smoking is essentially a habit. It will take 30 days to permanently change the habit of smoking to a habit of breathing fresh air and in doing so avoid smoking withdrawal. It is your task to ensure you listen to the CD each and every day for 30 days. Read the Health guidelines. You will be amazed at the tips and hints that are so easy to adopt in your normal everyday life. If you have a relapse, phone and book a follow up appointment immediately. It is only a trigger that needs to be addressed. It happens sometime. Phone, we cannot help if we don’t know! What Happens When I Quit Smoking Cold Turkey? When you quit using nicotine patches or gums, or through cold turkey treatment, your success rate is greatly reduced. This is because it may be difficult to avoid friends, family or work colleagues who ‘know you’ as a smoker. They want you to rejoin their ‘group’ and so they encourage you to start smoking again. With Quit Smoking in 60 Minutes therapy these situations have been dealt with during the hypnosis. But if you try to quit without hypnosis then the key to preventing a relapse in these situations is to recognise that certain environments and triggers encourage smoking behaviour. 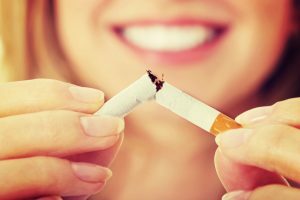 Here are some helpful tips from us to help you prevent smoking relapse. Avoid places where people typically smoke and where alcohol consumption is occuring. 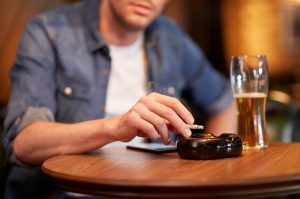 Alcohol and other people can often trigger cravings, therefore, to prevent relapse, try to avoid situations where your self control is put to the test. Sometimes it can be difficult to avoid these social situations, which makes it important to constantly remind yourself of why you quit smoking in the first place. It is important to learn how to face old smoking situations without cigarettes, and instead find new behaviours to substitute to avoid relapse. Don’t be impatient. Smoking is something that you get hooked on after years and years, so it’s important not to expect results instantly when you quit smoking. Everyone embarks on their smoke-free journey in different ways, and will take varying amounts of time to quit smoking for good. It is important to stay patient and think of the long-term rewards to help you as time passes. Learn to manage cravings. Cravings can bring about a smoking relapse, and are normally most difficult to manage during the first few days of quitting. Although there is no one treatment to satisfy smoking withdrawal cravings, a number of studies have supported the idea of using exercise and other distraction techniques to steer you away from the urge of needing to smoke. What Happens When I Quit Smoking Using Hypnotherapy? 33% of people never again feel the desire to smoke, or even think about smoking again. It is as if they have never had a cigarette before in their entire life. As for what to do after quitting smoking, you can do anything you like with fresh air in your lungs! 33% of people have a fleeting thought about smoking cigarettes but this vanishes as quickly as it arose. They have no cravings, but a week or so may go by and they might be finishing a meal or going to the bar and they have a fleeting thought about a cigarette. As quickly as the thought comes, the thought is gone. 30% of people can be persuaded by their friends and family to “just have one cigarette”. Some people have to be aware that there are things that could try and trick them into having a cigarette. They might be getting into the car or having a cup of coffee. “I’d really like a ciggy, yes, no, yes, no. No, I’m a fresh air breathing person.” As long as they remember to say no to that cigarette, and yes to clean air, they’ll be fine. You can stand up and do something else for a few moments. We’re sure you can easily handle that, but some people can’t and these are the few people that we want to give us a call so we can re-do the process and add in extra “anchors” to prevent this type of sabotage happening again. Our team want to ensure that once you quit smoking, you quit for good. With our services, we can anchor behaviours to guard against relapse and will take you through the steps of what to do after quitting smoking. To start your quit smoking journey, give us a call on 1300 64 53 54 or contact us and we will be happy to help! Meanwhile let's just say that we are proud Support contributed with 0 entries.